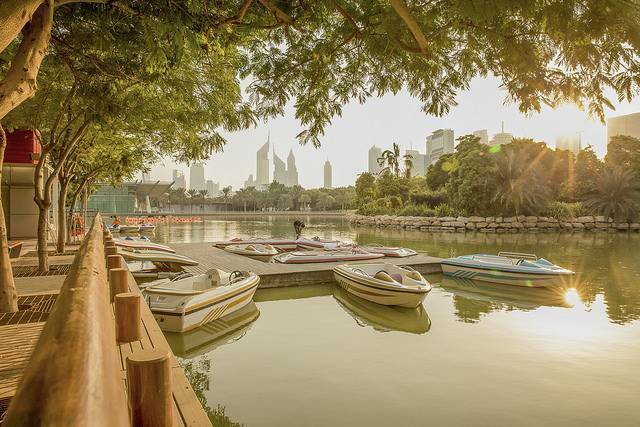 Zabeel Park is the new generation park which has its themes inspired by the technology. The park has recently been honored with an entry in to the Guinness World records for setting up a 12 meter miniature of the landmark, Burj Khalifa, at Garden Glow of this park, using recycled materials like medicine bottles and spreading the significance of recycling. The park is categorized into three zones, Technology, Alternative Energy and Communication. The park, sprawling across 47.5 hectares, has nearly 3000 trees and has numerous complexes in it that include Amphitheater, 3D edutainment halls, exhibition gallery and et al. Also featured are a 4.3 kilometer jogging track, skate boarding, ice rink, ice skating, BMX track, golfing areas, cricket pitch, butterfly garden, Jurassic park, Barcode garden, Candyland and a lovely train that will make a tour of the whole park. The park is popular for live music and light shows, and Indian festivals like Holi are celebrated. On Fridays, craft bazaars and food stalls, and daily, water and light shows liven up the atmosphere.